First cut a 6" x 9 1/2" piece of purple card stock and fold it in half for the base, a 4 1/2" x 5 3/4" piece of turquoise for the middle layer and a 4 1/4" x 5 1/2" piece of glossy white for the front. 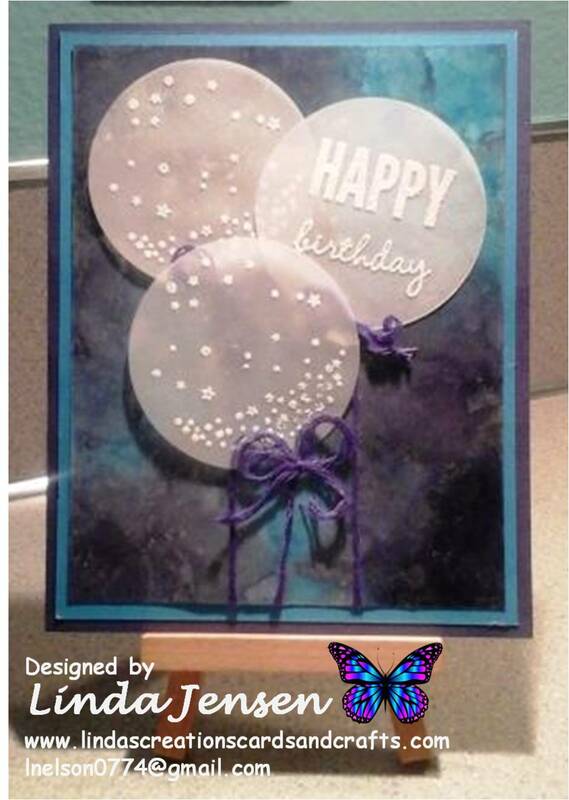 Next create the polished stone background on the glossy white card stock with the following re-inkers: Stampin' Up! Tempting Turquoise and Elegant Eggplant and Adirondak Silver Mixative. Click here for an awesome tutorial. Then heat emboss the balloons on vellum with Versamark ink and white embossing powder, cut them out with Stampin' Up! Balloons Framelits Dies, attach them to the front layer, then attach the purple baker's twine at the bottom of each balloon wrapping the end around the bottom of the front layer. Next attach the front layer to the middle layer then to the base and enjoy!